The Louvre is the world's largest art museum. It has some 35,000 works of art on display in 73,000 square meters of exhibition space. Moreover, it is a top quality collection including such treasures as Leonardo DaVinci's “Mona Lisa” and the Venus de Milo. The building that the museum predates it by several centuries. In the 12th century King Phillippe Auguste built a castle here as part of a project to fortify Paris. It became a royal residence in the 14th century during the reign of King Charles V.
While many of the French kings preferred to live outside of Paris, Francois I was anxious to assert his authority over the capital. Therefore, he began the process of transforming the old medieval castle into a royal palace. This process continued as long as the French monarchy lasted. As a result, the building incorporates various architectural styles. Francois was also interested in art and systematically acquired paintings. Indeed, he even brought DaVinci to France along with some of his best works. Subsequent French kings followed Francois's lead and so the royal collection grew over the centuries into an extensive and superb assembly. Inasmuch as King Louis XIV spent most of his time at Versailles, he granted permission for a number of royal academies to use the Louvre in their studies of the arts and sciences. In the years that followed, artists including Fragonard and David, lived for a time in the Louvre. This led certain philosophizers to suggest that the Louvre should became a temple to the arts and sciences. However, nothing became of this suggestion. When the French Revolution occurred, the revolutionaries decided that the royal art collection should be open to the public. Therefore, in July 1793, a decree was issued founding the Louvre Museum. While the nucleus of the museum's holdings was the royal collection, it quickly grew as works that the revolutionaries had confiscated from the church and from the French nobles were added. As Napoleon's armies conquered Europe, they brought back numerous treasures for display in the Louvre. After the fall of Napoleon in 1815, many but not all, of these trophies were returned to their original owners. However, acquisitions and private donations have filled the gaps in the collection. As a result, the Louvre has an encyclopedic collection that focuses on western art from the 12th century to 1848, works from civilizations of the ancient world, and works of Islamic Art. It has eight curatorial departments: Paintings; Egyptian Antiquities; Greek, Etruscan and Roman Antiquities; Near Eastern Antiquities; Sculptures; Decorative Arts; Islamic Art; and Prints and Drawings. Perhaps surprisingly, this quintessential French museum is not the place to see works by the French Impressionist masters. This is not a lingering effect of the prejudice that the art establishment once held against the Impressionists. Rather, in 1986 when the Musee d'Orsay was founded, it was decided that that museum would be the repository of the Impressionists' works. While the collection was growing, the building was evolving. Napoleon III's “New Louvre” project added more space and installed overhead lighting. During the period between the World Wars, a centralized visitor reception area was created and underground passageways were constructed making it easier to go between the various wings. As part of President Francois Mitterand's “Grand Louvre” project, a glass pyramid designed by I.M. Pei was erected in the Cour Napoleon in 1988. In addition to the art museum, the Louvre also operates Tuileries Garden and Carousel, which is adjacent to the building. It also operates the Musee Eugene Delaroix (that artist's studio); the Gypsotheque (plaster casts); and satellite museums in Lens, France and in Dubai. 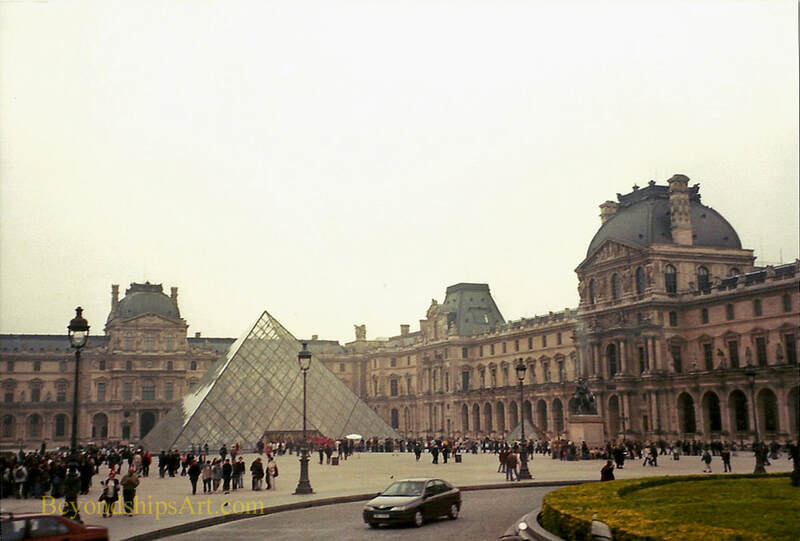 The Louvre attracts 10 million visitors each year. However, it is a very large facility and the crowds tend to congregate at the most famous works. The Louvre is a vast place and so it is best to study the floor plan beforehand (available on the Louvre's website). For information on visiting, see the Louvre's website. Above: The Venus de Milo. ​Below: Nike or the Winged Victory of Samothrace.